One of the recurring themes on The West Wing, one of the most renowned and rewarding television shows of all-time, is what Secretary of State Leo McGarry calls “Big Block of Cheese Day.” As McGarry tells us, year after year, Andrew Jackson had a big block of cheese in the main foyer of the White House when he was President, so anyone hungry could come and have something to eat, and in that spirit, once a year the fictional White House Staff take times out of their busy lives to hear from the little guy. When it comes to map and mapping the human mind, it’s all a matter of perspective. And that’s where the idea of redrawing Canada’s own map comes in. With immigration from around the world—particularly from the Middle East, the Indian subcontinent and Asia— Canada today is currently experiencing a population boom that’s reshaping the country. 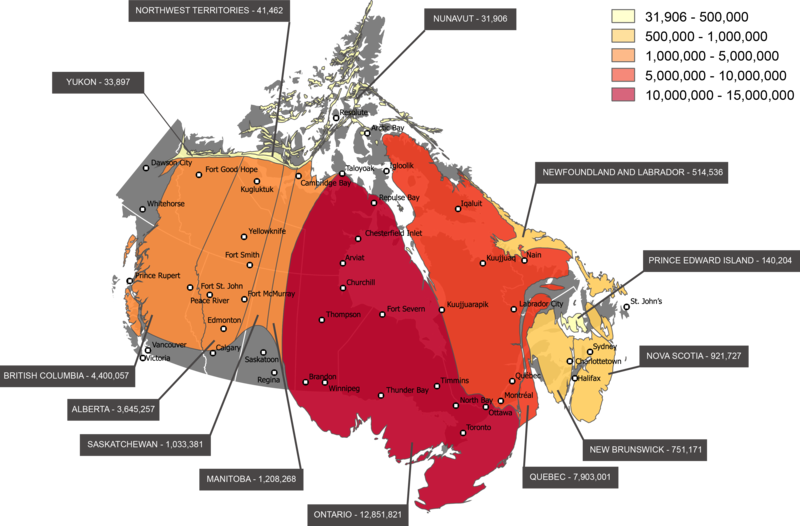 Northern Canada looks big on a map, but when it comes to population, it comes up small. Where Do the British Live in Canada? 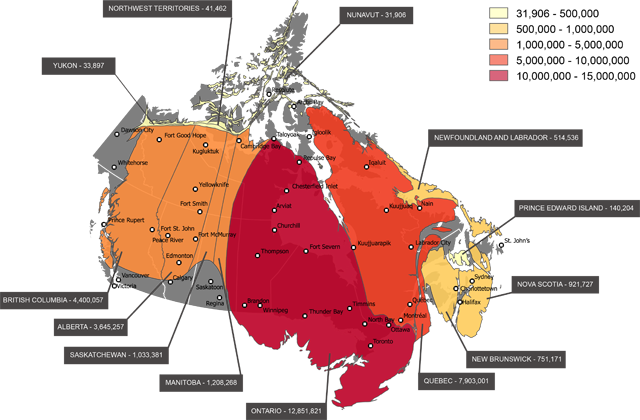 By contrast, Southern Canada has a population greater than its bounds, and it shows in more places than simply on the map. Concerning those maps, however, Southern Ontario is absolutely dominant. On the whole, the entire province is the most populous in Canada, has been for some time, and this process is only accelerating. That same OECD/World Bank survey found more than a 600K spike in the total population of Ontario, by far the biggest jump without adjusting for rate or per capita measurements. That said, the rate of change is likewise impressive, as this constitutes a 5.7% bump between 2006 and 2011 according to that survey. 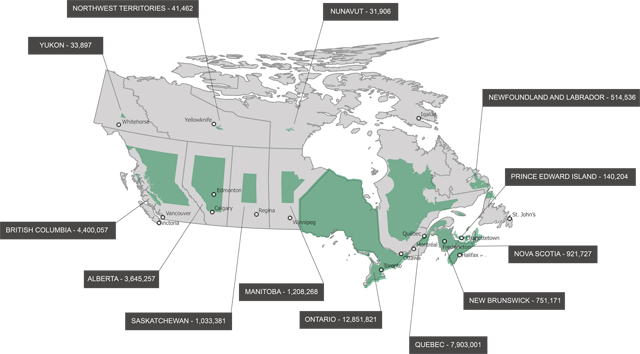 Other provinces are also getting in on the act, with Quebec’s southernmost region—home to Quebec City and Montreal—also enjoying huge boosts which would increase their prominence on a population-adjusted map. So what’s contributing to the continued rise of Southern Canada in general, and Ontario in particular? Simply put, Southern Canada in general and Ontario in particular are bastions of diversity, which means they’re also hot destinations for the immigration boom. Toronto and Hamilton are big players in this, as each attract a great deal of attention from immigrants in the Indian subcontinent and the Middle East. The Northeastern United States in general and New England in particular is a haven to small states and communities, casually liberal while remaining quaint and traditional. 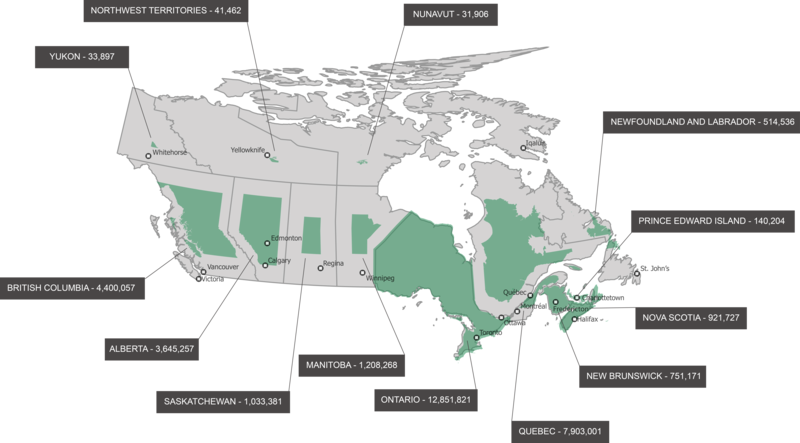 Martime Canada follows a similar pattern, as New Brunswick, Nova Scotia and Prince Edward Island look small-but-significant on a map and register that way according to the census as well. While all three of those provinces enjoy growth, it’s under 4%, less than the national average. In fairness, however, Ontario’s 5.7% is also under the national average, albeit just barely, by 0.2%. Western Canada in general and Alberta and British Columbia in particular are likewise huge beneficiaries of the rise in Canadian immigration. The Pacific Coast of North America has long been a hot spot for Asian immigrants, and more recently immigrants from the Indian subcontinent have likewise been transforming the economic and cultural landscape of the region. British Columbia in particular is the proud home to some of the most vibrant Hindu communities in Canada, while Alberta enjoyed the largest increase per capita in our OECD/World Bank survey from 2006 to 2011, as its population rose by an impressive 10.8%, good for 2nd place overall among the provinces. That said, as that episode of The West Wing showed, it’s all a matter of perspective when it comes to population-based maps. The clincher on that point? While Alberta, one of Canada’s more prominent provinces, was 2nd overall in growth by rate, the #1 slot went to none other than the Yukon, which we’ve already shown is big on land mass but small in actual population. Nevertheless, these trends do show that Canada is, overall, a large and growing country any way you present it.